In a few weeks, America’s roughly 53.5 million K-12 students will head to the classroom. These students will hit the books at one of more than 129,200 schools across the country, including about 5,700 charter schools and 30,900 private schools. 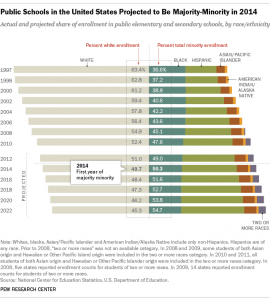 – As a whole, America’s K-12 students are more racially diverse than ever.The U.S. Department of Education projected that minorities would outnumber whites at public schools by fall 2014, due largely to fast growth in the number of Hispanic and Asian school-age children born in the U.S. Since 2000. – Most white students still attend largely white schools. Just 17.1% of whites attended a school where minorities made up at least half of all students in 2012. Meanwhile, more than three-quarters of Hispanics and blacks (and six-in-ten Asians) attended these majority-minority schools. – Students today are more likely to stay in school. As of 2013, America’s high school dropout rate had reached a record low: Just 7% of 18-to-24-year-olds that year had dropped out of high school, down from 12% in 2000. – America’s students have improved in math and science over the past 20 years — but remain behind students in many other industrialized nations. The United States ranks 35th out of 64 countries in math and 27th in science, according to a cross-national test known as PISA. While they may lag their peers in other nations, American students are outperforming one group: their grandparents. In fact, Millennials are on track to be the most educated generation in history compared with older generations when they were the same age.